The phone rang at 10pm the week before Christmas. It was one of my oldest friends, James, a Headteacher at an Independent School in Melbourne. James went on to describe his symptoms: he couldn’t eat; couldn’t sleep and had terrible pain in his chest and stomach. He’d been to the doctors who diagnosed “stress and anxiety”. Horrified, I asked what they suggested he should do. Unsurprisingly, they offered him a cocktail of drugs and suggested that he see a therapist. He rejected the drugs and saw the therapist, who was stumped. “You seem perfectly fine to me, I don’t know what to suggest,” he said. Fortunately I was visiting Australia that Christmas and was able to have a conversation with James on a long walk on the beach. I was shocked but not surprised by what was happening to him. Over the years I’d seen him push himself harder and harder; setting impossibly high personal standards as his career progressed. He didn’t eat sugar or junk food of any kind; drink any alcohol; twice a week he rose at 5.00am to train with a personal trainer before his hour long commute to work. His normal workday frequently extended to 9pm, where he got home, ate and caught up on emails and admin before crashing into bed at midnight. He was so busy at work he barely made time to go to the toilet. Sadly, his experience is by no means unusual in school leaders. A State of Education Report in 2017 revealed the very real struggles that teachers and students alike are facing in schools. It found that 47% of school governors expect “managing staff wellbeing and morale” to be a challenge in the coming year. 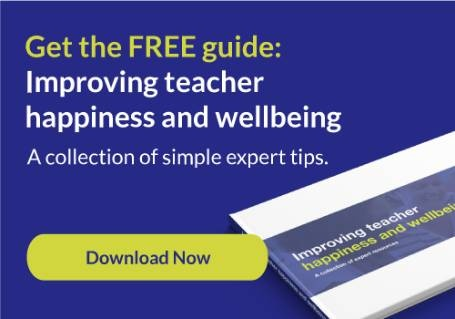 With increased pressure on performance, nearly 80 per cent of school leaders noticed an increase in stress, anxiety and panic attacks among their pupils over the past two years. We have to ask what is it costing us in terms of the physical, mental and emotional health of every single one of our children, staff and senior leaders? And more importantly: what are we doing about it? Even though many of these issues are deeply systemic, it doesn’t mean we should not strive to effect powerful change. It is well documented that when we’re stressed, our higher cognitive functions are inhibited. This means our ability to think clearly, learn, remember, reason and make effective decisions are limited. A 2014 Public Health England report on the link between pupil health and wellbeing and attainment concluded, perhaps unsurprisingly, that pupils with “better health and wellbeing are likely to achieve better academically”. Yet what are we asking our children, as well as staff to do every day? Think clearly, learn, remember, reason and make effective decisions, often under extreme stress. Imagine if we could reduce stress. The impact would be profound – not only on improved mental and physical wellbeing, but ironically on improved learning outcomes. As an educational publisher, I’ve been in hundreds of schools and see this is a widespread problem. As a trained counsellor I wanted to help. James’s experience led me to develop a very simple tool called “Ask IAN”, IAN being an acronym for the words Intention, Attention, No Tension. “Ask IAN” empowers every individual – from the Head Teacher through to the children - to take control of their thoughts and emotions in the moment. What is “Ask IAN” and how does it work? A helpful metaphor for Intention, Attention, No Tension is to imagine you are making a cake for a friend. Intention - you decide what kind of cake you want to make. Attention - you buy the ingredients and make the cake. No Tension - you put the cake in the oven and leave it to bake. When you’re feeling stressed, stuck or overwhelmed, “Ask IAN”. Check in and ask yourself questions using these 3 steps. Intention simply means getting clear about and consciously choosing what you want to create. It’s knowing what you’re doing and why. Intention is the starting point of everything. Every journey, every project, every invention. • Am I clear about what I’m doing now and why? • What is the purpose of what I’m doing? • Am I focused on the right thing? • What can I do to optimise my environment and remove any distractions? • Am I taking the right action? Am I clear what this is? • What small steps could I take toward my goals? This is where most of us struggle. We get stressed or anxious and block off the natural, healthy flow of energy. Imagine a hosepipe with water flowing through it and we bend it in half and stop the water flowing. This is what happens when we get in our own way with fear, worry or doubt. We stop momentum building around our creativity and work. Tension can be physical, mental or emotional. When we experience mental or emotional feelings like stress, worry, anger, frustration, sadness, shame, guilt, or anxiety it creates physical tension in our body. Releasing this excessive tension in the body is the first simple step in releasing it in our minds and emotions. It’s the first step towards healing. The main principle behind ‘No Tension’ is ease. What can I do now to relax? How can I ease this situation? How can I be kinder and more compassionate to myself and others? What can I remind myself to be grateful for? My health; my family; my supportive colleagues? Gratitude is the healthiest of all human emotions and restores balance remarkably quickly. Longer term you may want to look at your exercise routine; your sleep patterns; your support network of friends and family and how you can inject more fun into your life. The principles behind my work center around helping people get back to balance, from any extreme. Our bodies are extraordinarily good at doing this, with some guidance from us. So when we “Ask IAN”, we’re setting our Intention, which acts like a compass; focusing our Attention on the right things and taking the right action to move us towards our goals; and No Tension, reminds us to relax, breathe and enjoy life. I guided him through this process and “Ask IAN” was born. James set out clear intentions for himself and his work; he took action to take care of himself in a more balanced, healthy and relaxed way; and he took time to relax and ensure he gets at least eight hours sleep each night. The change in him is remarkable. He says “Ask IAN” helped him “challenge his priorities and his lifestyle”, helping him “rebalance his life”. He continues to work as a Head Teacher but now he prioritises his wellbeing and knows how to live a more balanced and fulfilling life. More remarkable, however, is how simple these changes are to put into effect. So simple in fact, that we can teach our children to “Ask IAN”. Maria Brosnan is a Business and Wellbeing Consultant.